Getting older….two words most women dread. I know women who have absolutely had a breakdown because they were turning another year older. Why? Getting all tore up and sad won’t make you any younger (psst-those worry lines make you look older). Just think you only have to do three things in life….live, die, and pay taxes. However, they all come with getting older! I have never been the type to get upset that I am getting older. Yes granted I am only 24 years old but I am 24 going on 90. I have always been older at heart. I guess that is why getting older doesn’t bother me. I remember being a teenager and watching QVC or crafting while my friends were out doing normal “teenager” things. Was I ashamed….no? I am 24 and love to wear a nightgown my 65 year old grandma gave me. Am I ashamed….absolutely not! I may only be 24 but I can definitely see signs that I am getting older. 1. My midday naps are like heaven. Yes I take naps whenever I can. If I could I would take one every day. There is nothing more comfortable than getting up early and being able to crawl right back into your comfy bed. 2. My idea of a wild Friday night is a date with Netflix. I am a real party animal….just let me tell you about it! Usually when I like to have a wild night the cast of Law & Order SVU and Friends are right there with me! They’ve turned into my best friends over the years….we’re pretty close you know. 3. I am in bed by 9:00 p.m. This is probably one of the biggest indicators that I am getting older. I have never been someone that could pull an all-nighter and be okay. Well helloooooo….I can’t even pull an 8 hour work day and be okay. I am ready to hit the hay as soon as I get home from work. 4. I look at teenagers and wonder what happened to the world. You know you are getting older when you can tell teenagers about how things were when you were their age. What is even funnier is when they look at you and talk about how old you are. I guess a 10 year age difference to them might as well be 100. 5. My car insurance will be cheaper. Thank you Lord for savings! Luckily when I turn 25 in a few months our car insurance rates will lower! Savings are always a good thing….even if it means I have to be older to get them. 6. I no longer care who does or doesn’t like me. When you are a teenager whether or not someone likes you is more important than world peace. As an adult caring about whether Suzie down the street likes you is the least of your worries. I have more important things to worry about…like my kids and husband. 7. I look like my grandma took me shopping. Okay I don’t lie so I should admit….I do get clothes from my Granny sometimes. I can’t help it! Clothes that should seem frumpy or granny-ish I….LOVE! I really shouldn’t admit that but who cares. I love frumpy old women clothes. Sorry not sorry! To some getting older is like the end of the world. Embrace getting older! Don’t see it as a bad thing but as a gift. Gifts are meant to be opened and enjoyed. Enjoy your life and stop worrying about getting another year older. One of my favorite quotes of all time is one by John Lennon, “Life is what happens while you are busy making other plans.” Don’t let this be you! Turn your birthday into a celebration and have an excuse for people to celebrate you. All I can say Kirstie is . . . Agree! 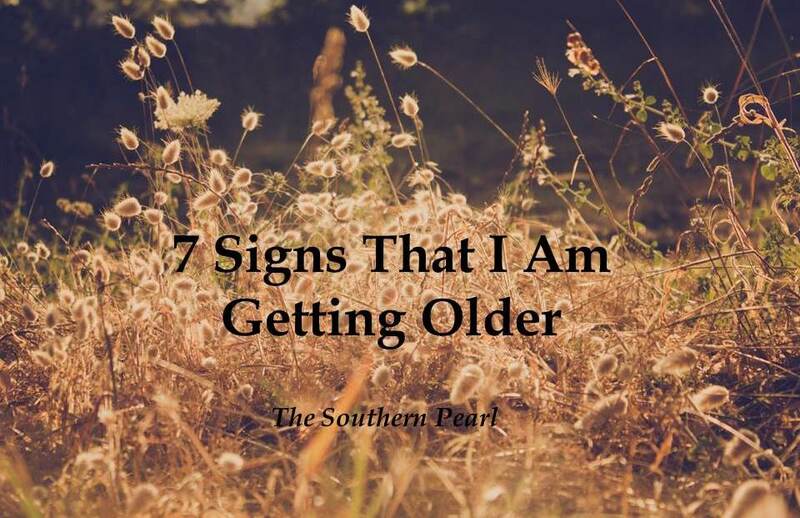 I’m already old and those signs are true.